Left-wing billionaire Tom Steyer is taking his campaign to impeach President Donald Trump to Times Square, announcing Monday he will be putting up "large billboards" in the heart of Manhattan. Steyer's has put $20 million into his campaign urging lawmakers to impeach Trump, with Steyer himself appearing in two television ads where he directly addresses the viewer about Trump as a threat to democracy and national security. Now, in spite of Democratic leaders like Nancy Pelosi (D., Calif.) who don't support him, Steyer is bringing his campaign to one of the busiest destinations in the world. "We’re putting a couple of large billboards in Times Square calling for the impeachment of the president," Steyer said Monday. "We legitimately feel that this is the huge issue in front of the American people that no one is standing up for what the overwhelming number of Americans think." The digital billboards, unveiled Monday, will be on display ten minutes every hour through New Years’ Eve, according to Need to Impeach, the political group founded by Steyer. 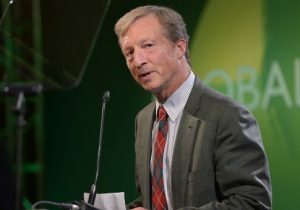 Steyer, a co-founder of Farallon Capital Management who left the San Francisco-based hedge fund in 2012 to spend his time and fortune fighting climate change, has become one of the most vocal opponents of Trump. In a campaign-style commercial that has been running on television since last month, Steyer looks into the camera and calls Trump a "clear and present danger," accusing him of obstructing justice and taking the U.S. to the brink of a nuclear war. Steyer has clashed with Pelosi and other Democrats over his impeachment campaign. Earlier this month, he called Pelosi "dead wrong" for reportedly referring to the movement as a "distraction." "It seems as if elected officials don’t think this is the time or don’t think that it’s tactically smart," Steyer said. "We’re not trying to be tactically smart. We’re not trying to in some way, shape or form use this for the ’18 midterms." Pelosi told CNN on Nov. 5 that impeachment was "not some place I think we should go." Steyer's campaign got Trump's attention when the impeachment ad aired during "Fox and Friends" last month. The president tweeted Steyer was "wacky" and "totally unhinged."